There’s also a great deal of discussion already going on at all the major DNA-related mailing lists and groups. Will you be ordering the new Big Y test? 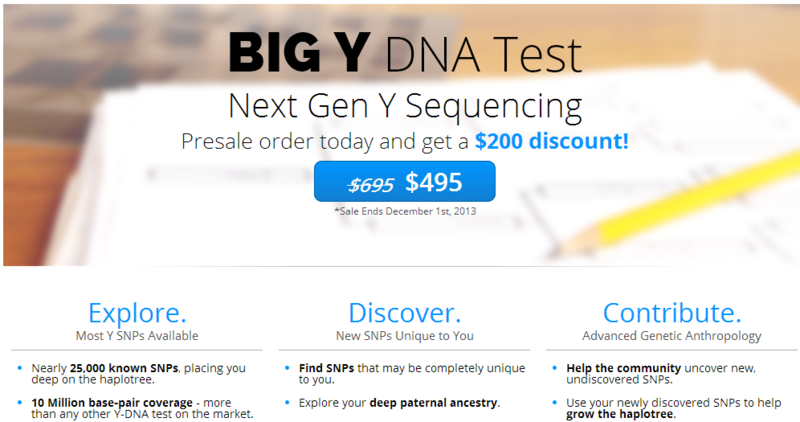 George Jones notes that some customers may consider this statement on a FTDNA website as somewhat misleading or advertising puffery concerning the new FTDNA “Big Y” test: “10 million base-pair coverage – more than any other Y-DNA test on the market.” Such statements should be investigated by a regulatory government body or consumer affairs group … and IMHO, that also goes for other claims being made in the DTC Genetic Genealogy Testing Marketplace. Comparing a $695 FTDNA Big Y test to a $1000 or so FGC test is not a pure apples to apples comparison as FGC provides Greater chrY coverage as Magoon says, 400+ STR reads, mtDNA test, analysis. All these DTC DNA tests without some sound analysis to customers have varying levels of Genetic Genealogy analysis is not a good game plan. In case anyone is wondering about the Big Y Test release of results today…..it has been very disappointing for pretty much all involved as test results were not delivered as promised today (and a fourth date of “hopeful” release was passed along to customers of the Big Y Test from Nov/Dec 2013..